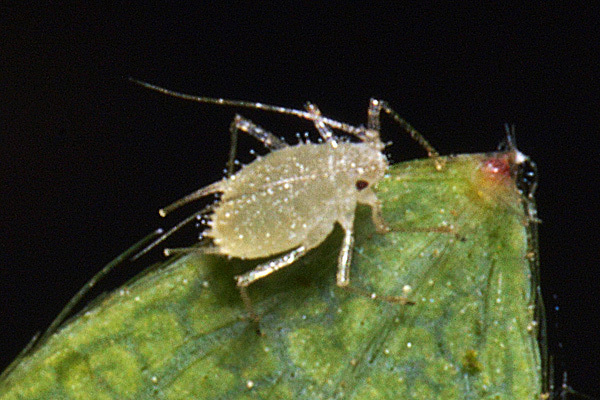 Chaetosiphon aphids are rather small, pale yellow to green, and spindle-shaped. The head has well developed antennal tubercles and a fairly large median tubercle. The antennal terminal process is usually quite long. The dorsal hairs of apterae are capitate and usually arise from tubercles. The rostrum is rather long. Their dorsal cuticle is densely covered with small warts. Their siphunculi are pale and cylindrical. The cauda is elongate triangular and much shorter than the siphunculi. 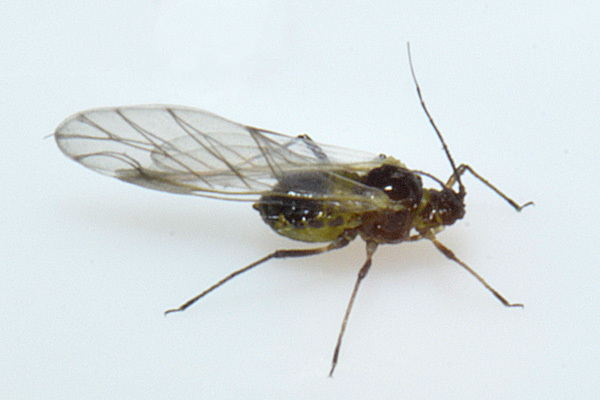 Alates have a dark head and thorax, much shorter non-capitate hairs, a large dark dorsal abdominal patch and dark wing veins. There are 17 Chaetosiphon species worldwide living on the family Rosaceae. They do not host alternate and are not attended by ants. The males may be winged or wingless. Adult apterae of Chaetosiphon fragaefolii (see first picture below) are translucent yellowish white to pale greenish yellow. The head has spicules, and the antennae are 0.9-1.1 times the body length. The third antennal segment has 2-7 thick capitate hairs. The body is covered with conspicuous capitate hairs. The siphunculi are long and cylindrical and 2.2-3.3 times longer than the rather short cauda. The body length of Chaetosiphon fragaefolii apterae is only 0.9-1.8 mm. The alate (see second picture above) has the head and thoracic lobes black and the abdomen pale greenish white with a brown-black dorsal patch. The alate body length is 1.3-1.8 mm. Chaetosiphon fragaefolii feeds on strawberry (Fragaria spp.) especially the cultivated varieties. In Europe it is rarely found on wild strawberry (Fragaria vesca), but in America it is found on some wild species such as the Chilean strawberry (Fragaria chiloensis). Chaetosiphon fragaefolii usually occurs on new shoots, in the crown and close to the veins on the undersides of leaflets. The species mainly overwinters as parthenogenetic forms, although sexual forms have been produced in the laboratory. Adult apterae of Chaetosiphon potentillae (see first picture below) are yellowish or whitish. The head has well developed, angular, antennal tubercles and a large median frontal tubercle. 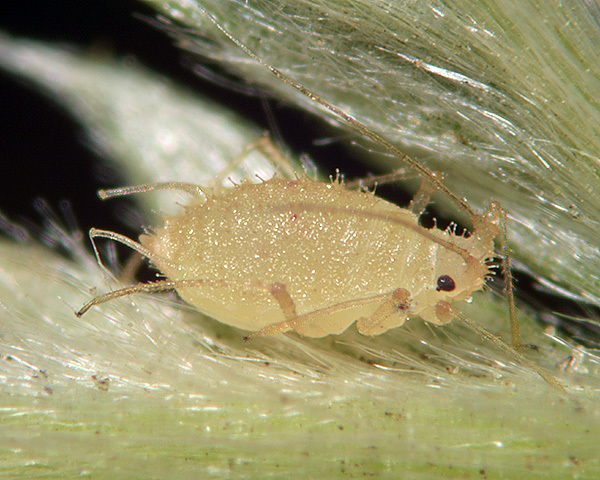 The third antennal segment has 8-12 thick capitate hairs (cf. Chaetosiphon fragaefolii which can be found on silverweed and has 2-7 thick capitate hairs on that segment). 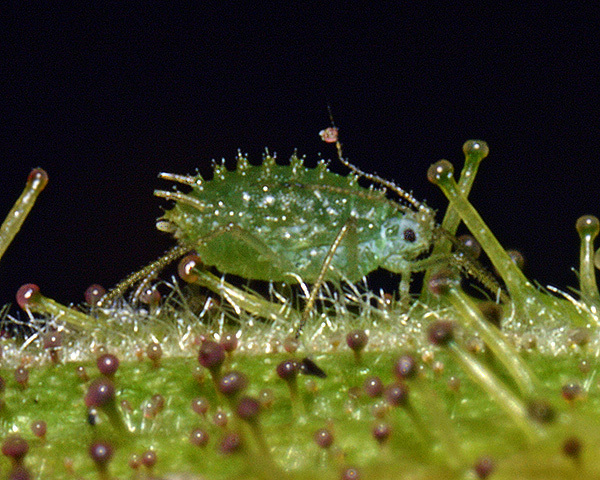 The fourth and fifth antennal segment are usually without secondary rhinaria (cf. Chaetosiphon fragaefolii which has 2-10 secondary rhinaria on the fourth segment and 0-1 on the fifth). The dorsal hairs of apterae are thick and capitate and arise from tubercular bases. Siphunculi are pale, cylindrical, quite thin and with a well developed flange; they are 2.2-3.3 times longer than the cauda which is elongate triangular. 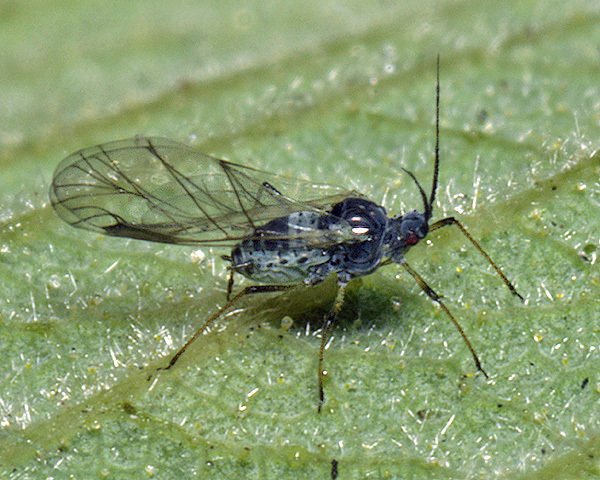 The body length of the adult Chaetosiphon potentillae aptera is 1.4-2.1 mm. The alate (see second picture above) is light green with a central dark patch and several dark transverse bands on the abdominal dorsum. The wing veins are dark brown. Chaetosiphon potentillae does not host alternate, but remains all year on silverweed (Potentilla anserina) and barren strawberry (Potentilla sterilis). 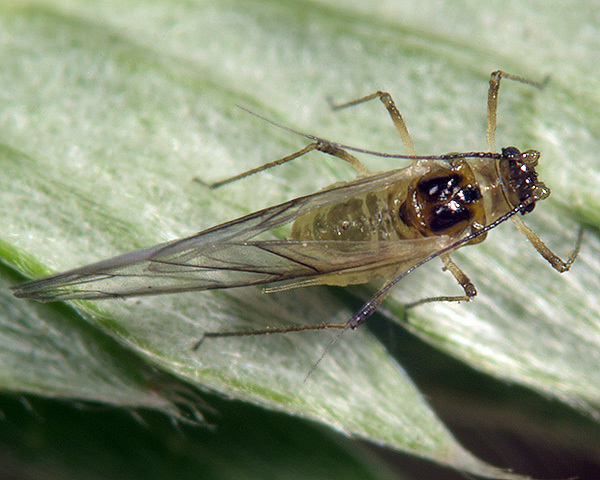 Yellowish oviparae and slender-bodied brown apterous males develop in autumn, with overwintering eggs laid on the host leaves. Chaetosiphon tetrarhodum adult apterae (see first picture below) are pale green to yellow-green or occasionally reddish. The head is rather smooth with few if any spicules. The antennae are short, only 0.6-0.8 times the body length. The dorsal cuticle is densely covered with flat warts giving it a wrinkled appearance. Each abdominal segment bear 5 pairs of capitate hairs. Their siphunculi are 1.1 to 2.5 times longer than the cauda. The body length of Chaetosiphon tetrarhodum is 0.7-2.1 mm, with the smallest individuals in mid-summer. Winged viviparae (see second picture above) have a dark head and thorax, a black central patch on the abdomen and dark wing veins. Oviparae are dark olive-green and the apterous males are small and dark. Chaetosiphon tetrarhodum is found on various species of roses especially the Japanese rose (Rosa rugosa). In spring they can be found on the shoot tips, young leaves and developing flower. Later in the year they can be found singly or in small groups on the undersides of mature leaves. Sexual forms occur in autumn. The distribution of Chaetosiphon tetrarhodum is worldwide.